cPHulk is a service that provides protection for your server against brute force attacks. A brute force attack is a hacking method that uses an automated system to guess the password to your web server or services. When cPHulk blocks an IP address or account, it does not identify itself as the source of the block. Instead, the login page displays the same message as if you were trying to use incorrect access details: The login is invalid. So if you were able to log in with the same login details before but now getting The login is invalid error, most likely you triggered cPHulk block. Permanent block - will occur after triggering several temporary blocks. Can only be lifted manually. Once enabled, you will be able to adjust its configuration and monitor failed login activity. You can be find the detailed explanation of all settings in the official cPanel guide. You can whitelist/blacklist multiple IP addresses at the same time or even full networks specified in the CIDR format. NOTE: It is highly recommended to whitelist your own IP address in order to avoid a lockout from the server. There were too many failed login attempts via the SMTP protocol to the guest@tpsupport.info email account from some device with an external IP address 31.210.124.242. It led to a 360-minute block (such period of time is specified in the Configuration tab). The block was issued at 05:04.22 and will expire in 345 minutes from now (or specifically at 11:04:22). With these logs, you can troubleshoot the cause of the blocks and, for example, if suspicious log entries were found, blacklist the abuser’s IP address. 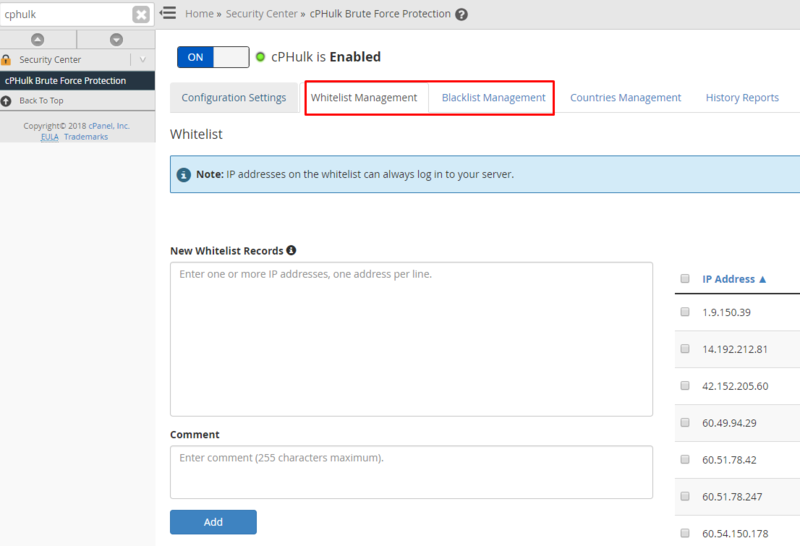 If you have Configure Server Firewall installed, it is also possible to enable automatic firewall IP blocks apart from cPHulk ones. The main difference between these blocks is that the firewall block will not allow server access at all. Make sure you whitelist your own IP address before enabling the automatic possibility of being locked out from your own server. It is also possible to manage cPHulk from the command line interface via SSH. We suggest checking a corresponding cPanel manual as well.